Product prices and availability are accurate as of 2019-04-16 15:17:00 EDT and are subject to change. Any price and availability information displayed on http://www.amazon.com/ at the time of purchase will apply to the purchase of this product. Product Description This ADSL Splitter separates voice signal and ADSL digital signal from telephone signal. 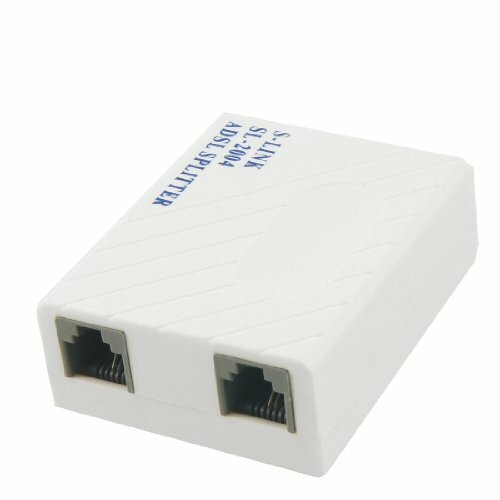 RJ11 Line Splitter protects the voice signal and ADSL digital signal from the interference of a telephone and a fax machine. One 6P2C RJ11 socket at one end for line. Two 6P2C RJ11 sockets at the other end for phone and modem.